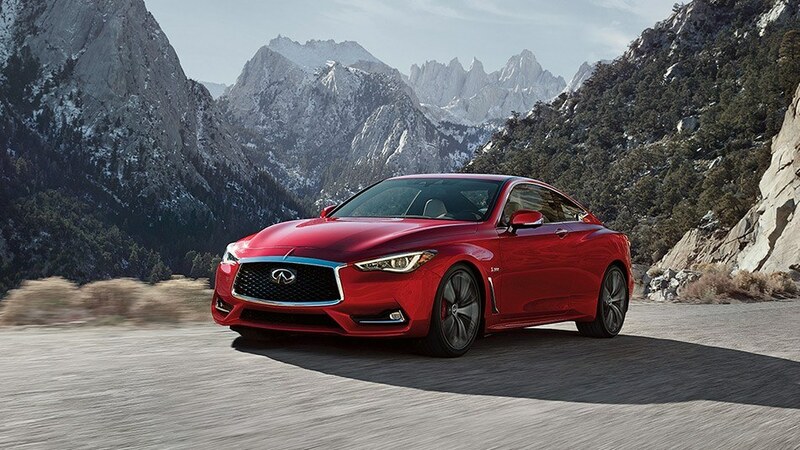 The all-new 2019 Infiniti Q60 lets you experience jaw dropping performance every day! It all begins with your choice of two available Twin-Turbo V6 Engines! The available 3.0-Litre Twin-Turbo V6 with 300-Horsepower, or the available 3.0-Litre Twin-Turbo V6 with 400-Horsepower! Dynamic Digital Suspension, Direct Adaptive Steering, and Drive Mode Selector, also revolutionize how you drive! On the inside, the Q60 offers a luxurious interior space. With available trims made from Aluminum, Carbon Fiber, or Silver Optic Fiber. Standard Semi-Aniline Leather Seating, and a standard Leather-Wrapped 3-Spoke Heated Steering Wheel also add a touch of class. Plus, the drive just gets better when you add in Dual Zone Automatic Temperature Control, and the Infiniti Intelligent Key with Remote Keyless Entry! In addition, the 2019 Q60 also comes packed with great standard technology features, including the BOSE 13-Speaker Premium Audio System – with AM/FM/HD Radio/CD/MP3, the Infiniti InTouch Dual Display System – with Upper 8-Inch and Lower 7-Inch VGA LCD Touchscreens – including Navigation, Lane Guidance, and 3D Building Graphics! Plus, the 2019 Q60 also comes standard with the Bluetooth Hands Free Phone System, and Two USB Connection Ports! Also, in keeping safety a top priority, the 2019 Q60 also offers great standard Driver Assist Technologies such as Brake Assist, Electronic Brake Force Distribution, Vehicle Dynamic Control with Traction Control, a RearView Monitor, Intelligent All-Wheel-Drive, a Tire Pressure Monitoring System, a Vehicle Security System, a Vehicle Immobilizer System, Forward Emergency Braking with Pedestrian Detection, and Predictive Forward Collision Warning. Also available is an AroundView Monitor, Blind-Spot Warning / Intervention, Back Collision Intervention with Rear Cross Traffic Alert, Lane Departure Warning, Lane Departure Prevention with Active Lane Control, and Distance Control Assist! On the exterior the Q60 showcases a powerful stance. Signature elements such as LED Headlights and a Double-Arch Grille make it unmistakably Infiniti! Plus with standard 19-Inch Alloy Wheels, a Power Sliding/Tilting Moonroof, Power Memory Heated Outside Mirrors with Integrated LED Turn Signal Indicators, Automatic On/Off LED Headlights with LED Daytime Running Lights, LED Fog Lights, Front Turn Signals & Rear Brake Lights, and Welcome Lighting, the 2019 Q60 is a head turner! Infiniti’s Q60 is also no stranger to receiving awards! In 2017, the Q60 was the winner of the iF Design Award! In addition, the Q60’s 3.0-Litre Twin-Turbo V6 has been listed among Wards 10 Best Engines of 2018! The 2019 Q60 comes available in three trim levels: 3.0t Luxe AWD, 3.0t Sport AWD, and the 3.0T Red Sport AWD. If you are interested in finding out more information, then please feel free to stop by and visit us, or browse our 2019 Q60 Online Inventory!